It’s a great feeling when you get a call from your Realtor and she tells you that a buyer has requested a showing of your house. Unless your home is a mess. In that case, your head starts spinning as you frantically scramble to get it picked up and clean. Here are a few tips to help you keep your home clean while it’s listed. 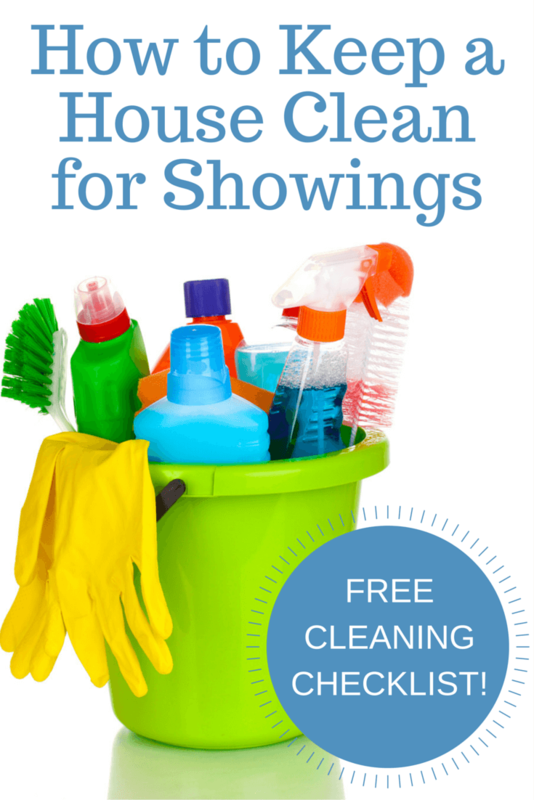 Make sure to download our free Home Showing Cleaning Checklist. It’ll help you keep every inch of your house clean—even those spots that are easy to forget about. It’s much easier to clean a house that doesn’t have a lot in it. When you decide to sell your house, rid it of unwanted items. The fellas at Goodwill should be your new best friends. Those inline skates you haven’t used since 1995? Yeah it’s time to get rid of those! Again, the less stuff in your home the easier it will be to keep it clean. Rent a storage unit for items in your home that you want to keep but don’t use on a daily basis. For example, if it’s June when you sell then you won’t be needing your holiday decorations for another 5 months. 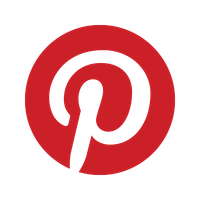 BONUS: If you have a lot of furniture in your home, storing a few pieces in a storage unit will make your home appear bigger. And your closets will look bigger if they aren’t stuffed with clothes, so store the opposite season’s clothes. Take a few minutes at the end of each day to straighten up your house. Make this a family affair and have everyone help by picking up their belongings and putting them away. Straightening up each day means that when your Realtor calls you won’t need to make a mad dash around the house picking up and stuffing things into closets. Before you cringe at the idea of cleaning every day, just think how much LESS time you’ll spend cleaning on the weekends if you take care of a few tasks each day. Certain tasks, like washing dishes and broom sweeping the kitchen floor, should be done daily. But other tasks, like dusting and mopping, can be done every few days. Laundry has a special way of spreading all over the house. Dirty laundry seems to erupt out of the hamper and spread all over the floor and clean laundry mounds up in the corner waiting to be folded. The best way to prevent this is to stay on top of laundry. If you have a large family, do a load each day. Once laundry is clean, fold or hang it right away. When you get that call from your Realtor, there’s rarely enough time to do all your laundry and it’s an unattractive thing for buyers to see. Staying on top of laundry is the best solution. There’s no shame in hiring help if you need it. Keeping a house clean is a lot of work, especially if you have children or work outside of the house. Hiring a cleaning service to help keep your home clean while it’s on the market is a wise expense for many sellers. 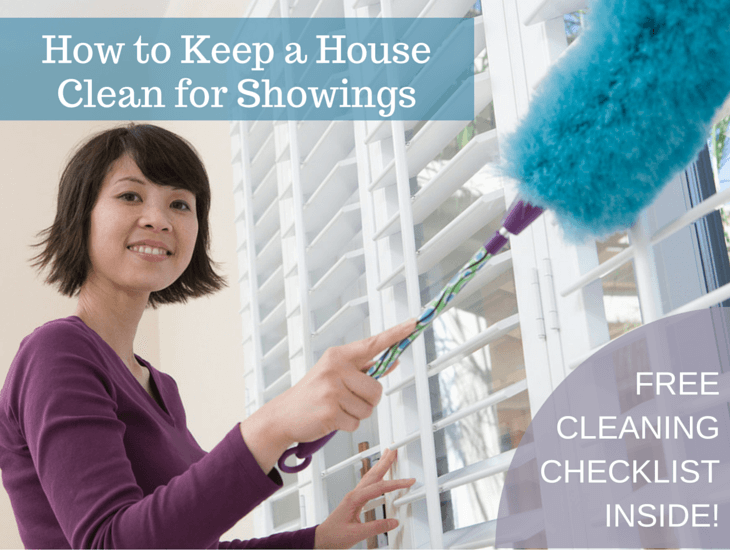 Download our free Home Showing Cleaning Checklist! What’s your best tip for keeping a house clean? Please share in the comments below.